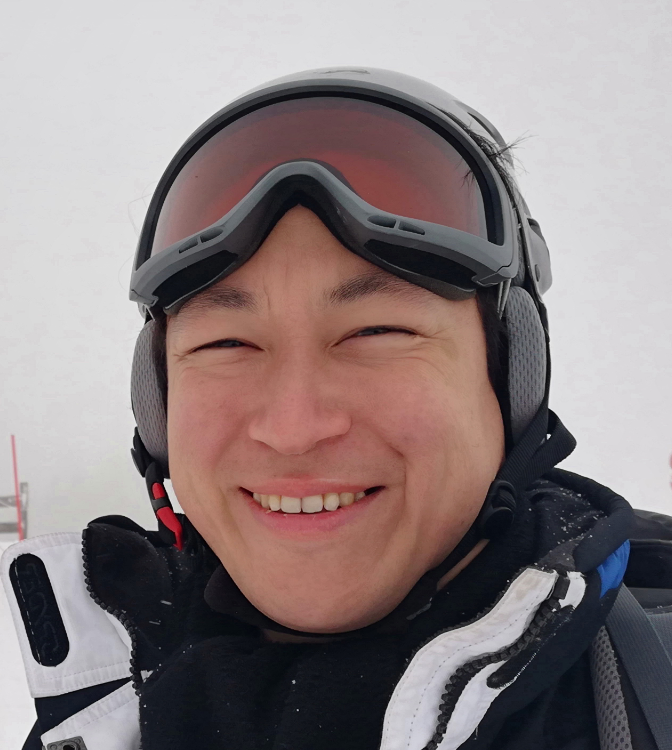 On February 17, 2018, it was my second time testing a fuel cell-electric vehicle (FCEV) at Winter conditions. HY! 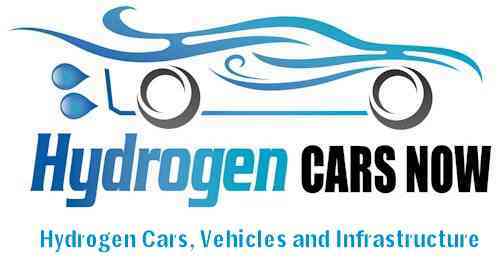 My hydrogen car driver’s name is #HydroChan. 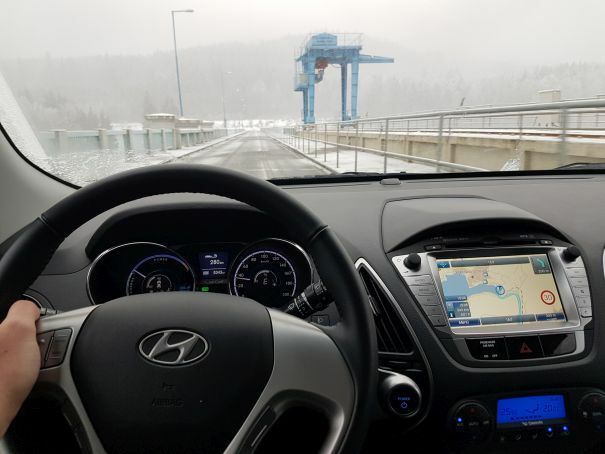 I test future mobility and share my hydrogen experience. The first time I winter-tested an FCEV, it was in the Triglav National Park in Slovenia, and I had to cope with a limited supply of hydrogen along the way. I needed to drive slowly to get the highest possible range. 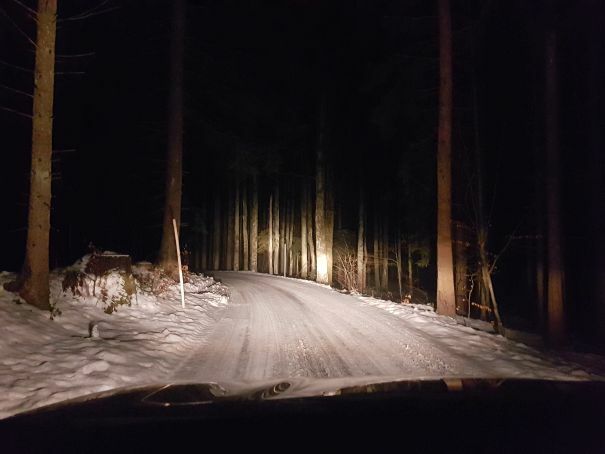 This time, in the Bohemian Forest, I also drove slowly, but because the roads were covered with snow. Coming up North at night-time, I left the Asten OMV hydrogen refuelling station with a full tank and had to find my hotel in Hinterschiffl, near the German border. The temperature was plus 3-4 degrees Centigrade. 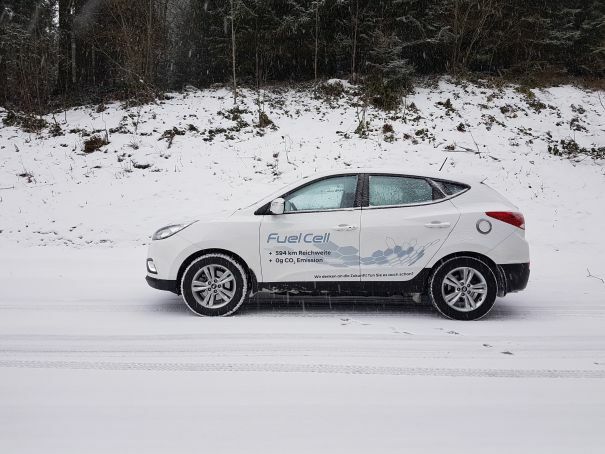 Narrow roads were covered with snow and the Hyundai ix35 FCEV had a good grip. I chose the ECO (E) driving mode, and at times the LOW (L) driving mode. At Gasthof Greiner in Hinterschiffl (Julbach), I had delicious Bernstein Bier, fantastic Leberknödelsuppe and an amazing Bauerntoast for a late dinner. You got to see it to believe it. Stefan Greiner told me that his neighbours were in Germany. 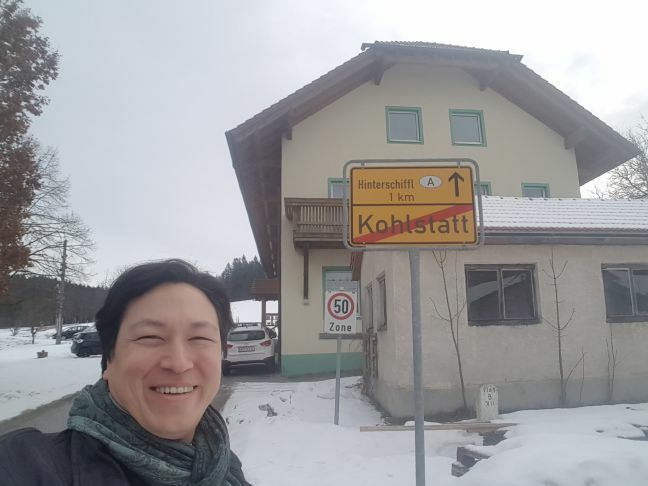 The adjacent village in Germany is called Kohlstatt. There used to be a border that was highly securitised. But in fact, the Bohemian Forest spans across three countries united, among others, by their excellent food. The tall building in the picture above is the hotel Gasthof Greiner, Family-run in the 4th generation. 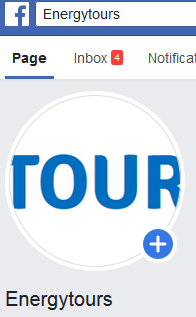 The three neighbouring countries Austria, Germany and the Czech Republic do not only share some of their Bohemian cuisine but also the recreational aspect in life, such as golf and other adventurous activities. Christian Keuschnig from Golfpark Böhmerwald gave me a tour around the course (open mid-April to mid-November). Do be prepared for occasional Bohemian winds. 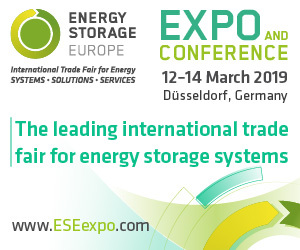 They also feature parking slots for camper vans, and electric cars (EVs) can be recharged as well. In the picture above, Christian and myself demonstrate future mobility with one Renault ZOE and one Hyundai ix35 FCEV. We took them for a spin. 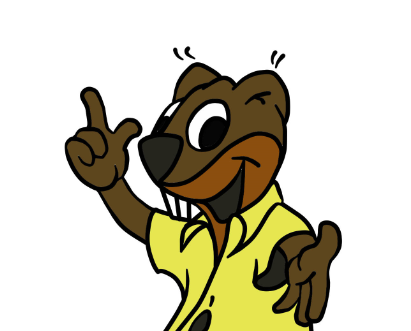 Some regions have abundance of wind, others of sun, and when water flows you have hydropower potential. When I crossed the Austro-Czech border, I came to the Vltava River (přehrada Lipno/Moldau Stausee, maximum length 42 kilometres), and stopped at the hydropower plant near Lipno Nad Vltavou. The South Bohemian Region is frequented by tourists from all across Europe, among others I saw licence plates from The Netherlands. The picture above shows the bridge across the river, as I was heading back to Vienna to refuel at Floridsdorf OMV hydrogen refuelling station. The temperature was minus 1 degree Centigrade, and I only used the FCEV’s heating for a short time, although I am told that onboard equipment does not use much electricity unless you turn on the air conditioning. Anyone having driven a Hyundai, knows they are functional cars with performance, reliability and comfort. One of my favourites is the onboard navigational aid. Driving with an electric engine allows you to rev up without much resistance. On icy roads this can mean a little too much power at times, especially in narrow curves. The three driving modes “D” (fastest), “E” (moderate) and “L” (slowest) actually relate to the acceleration. Switching between them while in motion is easy and makes me think I can save some energy at times and shortly speed up at other moments. What makes this car unique is that it is so easy to handle because everything is nicely balanced for my taste. And since I drive with all six senses, I am completely satisfied. Last not least, the Czech Republic is now my eighth country where I drove an FCEV, and the Energytours shall continue. This picture was taken shortly after the Czech-Austrian border heading back South-East near Marktplatz and Windhaag in Upper Austria. The temperature even came down to minus 3 degrees Centigrade. I tested various speeds and dared a few controlled braking manoevres, and I feel very safe in this car. 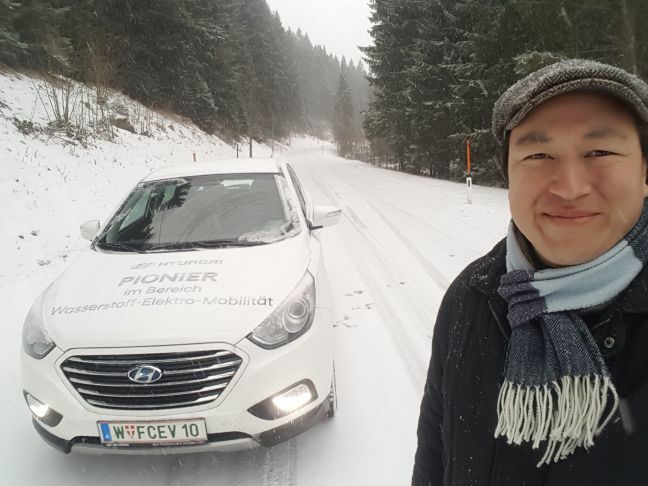 My special thanks go to Hyundai Austria who let me test their vehicles every once in a while. Gamsahamnida! I shall return to the Bohemian Forest, maybe also during a greener season. 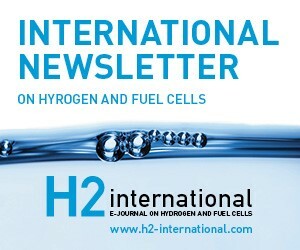 Just step into a fuel cell-electric vehicle and start driving the hydrogen experience. 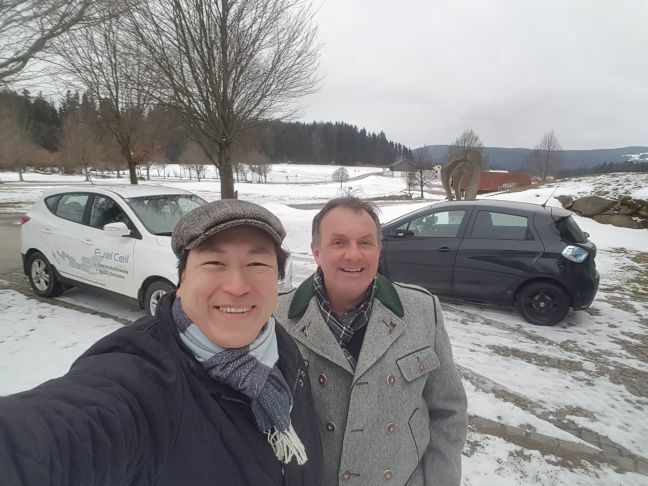 ..I appreciate the good will from pioneer #HydroChan to promote FCEV..
You are the pioneer ever since Slovenia built the 1st Hydrogen Refuelling Station in 2013 in Lesce, Triglav National Park. I hope to be back to Slovenia, soon.